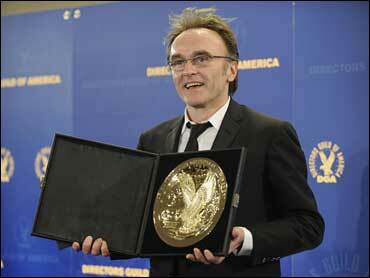 "Slumdog Millionaire" continued its rags-to-riches march through Hollywood's awards season as its filmmaker, Danny Boyle, won the top honor Saturday from the Directors Guild of America. The win puts Boyle on the inside track for the same prize at the Academy Awards on Feb. 22, since the guild recipient almost always goes on to win the directing Oscar. While "Slumdog Millionaire" started as an underdog that nearly went straight to DVD, it has emerged as a potential Oscar favorite. Audiences have embraced Boyle's tale of a poor boy rising to fame and fortune from the streets of Mumbai, and the film triumphed at the Golden Globes and Producers Guild of America Awards, while taking the prize for best ensemble cast from the Screen Actors Guild. "Slumdog Millionaire" originally was to be released by Warner Independent, but its fate went into limbo after Warner Bros. closed down that arthouse banner. After a brief prospect of going right to DVD, the film found a theatrical home with Fox Searchlight, which has had success with such smaller films as "Little Miss Sunshine" and "Juno." "I should start by curiously thanking Warner Bros. for actually having the grace to do the right thing, when I think it would have been a lot easier to do the wrong thing, and pass the film on to Fox Searchlight, who are an extraordinary bunch of people," Boyle said. Backstage, Boyle joked about the fact that his award was presented by Joel and Ethan Coen, who won the prize a year ago for "No Country for Old Men." "To step into the shoes of people like the Coen brothers, I mean, it's phenomenal, because I have, as I admitted in the earlier speech, I've stolen from them all my career," he said. "I mean in a naked and appalling way." "The Office" won the top honor for television comedy, "The Wire" took the award for TV drama and "Recount" won for TV movie. Paul Feig received the award for an installment of "The Office," whose competition included two episodes of "30 Rock," the series that has dominated at recent Hollywood honors such as the Golden Globes and Screen Actors Guild Awards. "We're in a real golden age of TV comedy, and I'm just happy to be part of it," Feig said backstage. The drama series prize went to director Dan Attias for an episode from the final season of "The Wire," a far-reaching drama with a huge cast exploring police, criminals, courts, schools, politics, media and other facets of life in Baltimore. "Austin Powers" and "Meet the Parents" director Jay Roach was the recipient for the election drama "Recount." Ari Folman's "Waltz With Bashir" won the documentary award. The film, which is nominated for best foreign-language film at the Academy Awards, is director Forman's animated study of a soldier struggling to recall suppressed memories of his involvement in the war with Lebanon. Chicago Sun-Times film critic Roger Ebert was honored with an honorary life membership in the guild. Michael Apted, the guild's president, noted that Ebert no longer can speak because of complications from thyroid cancer, but he told Ebert, "We're happy that it didn't stop you from writing about our work." The ceremony featured recorded testimonials to Ebert from directors including Steven Spielberg, Clint Eastwood, Martin Scorsese and Oliver Stone. "The motion picture is the art form I love above all others," Ebert said in a statement recorded via a synthetic computer voice. "It is the symphony, and you are the conductors." Reality programming: Tony Croll, "America's Next Top Model." Children's programs: Amy Schatz, "The Poetry Show." Daytime serials: Larry Carpenter, "One Life to Live." Among Hollywood's many honors on the buildup to the Academy Awards, the Directors Guild prizes have one of the best track records for predicting eventual Oscar winners. Only six times in the guild awards' 60-year history has the winner failed to take home the directing Oscar.